Neil Gaiman's Journal: ATTENTION: OCTOBER 15th ALERT. NB DON'T SAY I DIDN'T WARN YOU. ATTENTION: OCTOBER 15th ALERT. NB DON'T SAY I DIDN'T WARN YOU. Right. This is the plan. If you are going to be in London on Tuesday, October the 15th 2013, you should buy tickets to come and see me read the whole of FORTUNATELY, THE MILK... on stage at the Central Hall, Westminster. The event is being presented by Time Out Live and Foyles. 1) I will read all of Fortunately, The Milk... live on stage. This will take around an hour. 2) Chris Riddell will be drawing stuff live as well, on the stage for everyone to see. 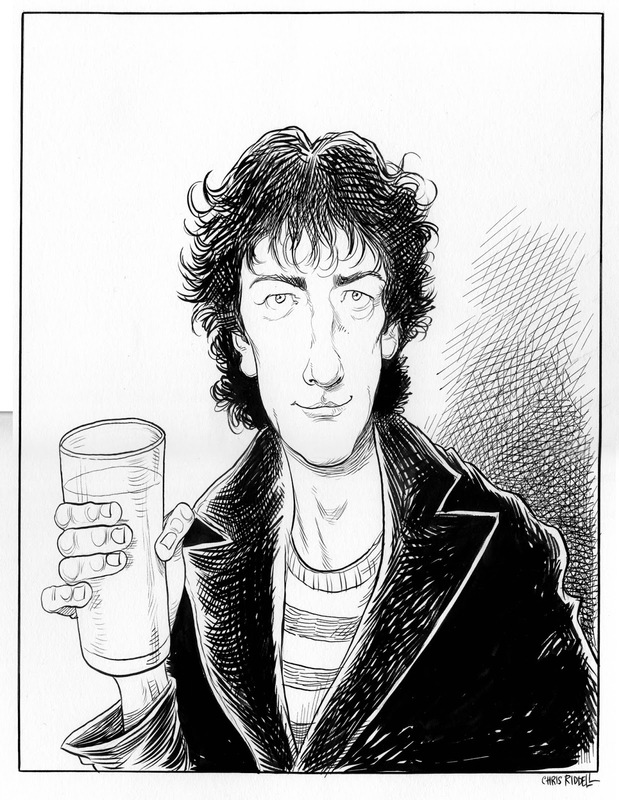 Here is a picture that Chris Riddell did of either the dad in Fortunately, The Milk, or of me. I do not dare ask him which it is. 3) The tickets will cost £10, £8, and (these ones come with a special limited edition of the book) £20. 2) There will be mysterious guest stars. Some of them might make some music to accompany things. There won't be a signing after the event. A lot of the books available for sale at the event will most probably have been signed by me that afternoon, however. There won't be a second performance. We're talking about taping or webstreaming this but no decisions have yet been made, so if you want to be there, you should do your best to be there. 1) Ice skating and ladies who dance through hoops of fire. 2) Real live dinosaurs attacking. And go to the bottom of the page, and click on buy tickets. Tickets are already selling fast, so you may want to strike like a cobra. Or at least, click on the link. Yes it will. Please come. I MEAN, IT SOUNDS PRETTY BORING, YOU JUST READING A STORY. ALSO IT'S TUESDAY EVENING. I HAVE MACRAME ON TUESDAY EVENING. WILL THERE BE REAL LIVE DINOSAURS AND ALIENS AND WUMPIRES AND PONIES LIVE ON THE STAGE, AND HUMAN SACRIFICE, ICE SKATING AND LADIES WHO DANCE THROUGH HOOPS OF FIRE? There will not. I thought I covered this already. Come anyway. Fun, remember? I would, if I were you. After all, if you tell them that you went to see the only performance of Fortunately The Milk without them they may grow to resent you and eventually plot against you and bring you down at your moment of triumph. I WANT TO COME BUT I LIVE IN BRAZIL. Brazil is a lovely place. On October the 15th you must drown your sorrows in cachaça-based alcoholic drinks, and go to the beach, and think about what you are missing. WHAT IF I DO NOT LIVE IN BRAZIL? Why don't you live in Brazil? The weather is wonderful, the people are delightful. One day we shall all move to Brazil, drink cachaça-based alcoholic drinks and sit on the beach, where we shall talk about art. ARE YOU SURE ABOUT THIS? THE WHOLE MOVING TO BRAZIL THING? No. I just ran out of useful questions and answers about the October the 15th FORTUNATELY, THE MILK night. Here, have a caipirinha.